Started reading this today, from kirsten365's book club deal. Not sure it's really my thing, I've read Emma but none of the others. I've heard others raving about it though so I'll give it a go. sending to BlossomU as part of a bookrelay. I just finished it, it was obviously a very fast read. I really enjoyed it, a lot more than Sister Noon, the other KJF novel I had read. The style is nothing like Austen´s, and like Sister Noon the plot is all loose and wavery, the novel a collection of impressions and feelings and bits of history - but here it worked lots better. 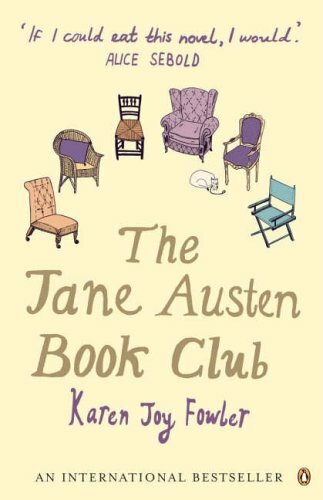 6 people, 5 women and Each of the 6 characters form a club to read and discuss one Austen novel a month, and somehow each of them has some relation to an Austen novel, some of them echo more than just one Austen novel, and a lot of the book is about how each person´s Austen is different. The writing was mostly lovely, though with a few sentences now and then which made no sense. The narration was extremely strange, an omniscient "we" at times, a "I" in some parts, but it worked for me. And for extra special fun, the book includes pages of opinions on Jane Austen throughout the ages, loved that part. I am gonna organize a small local bookring right now, I know at least Xana and Virgulina want to read it. ( must check if somebody else is interested). And after book returns to me I got some other release plans for it. I confess I haven't read any of the books by Jane Austen (yet!) but I've seen a couple of the movies, though I know it's not really the same. I agree with pam99 when she says that you'd probably have to be a bigger fan of Jane Austen to really enjoy this book. The book discussions didn't interest me at all and the story outside the bookclub was very feeble. The characters lacked depth and I didn't care for them or what happened to them. Maybe when I've read a couple of Jane's books I'll pick this up again! passed on to me by BlossomU at the beerdeck in expo yesterday. I started browsing through it and started to read it immediatly.looks like a fast and enjoyable read. fast and enjoyable read though I somehow lost interest in the characters in the last chapters.And the narrator's omniscience is a bit strange. Made me want to re-read Jane Austen because I noticed I had forgotten a lot about them and that maybe I skipped something between the lines. 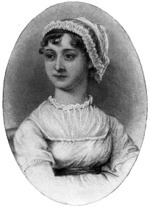 It was particularly interesting to read the reviews on her work by several people since when she started to write until today:everybody really has a different Jane Austen . Thanks for sending it! I'll read it asap. I liked it! It was my first by this author and I didn't really know what to expect but it was a nice read in the end. The best part is that it made me want to reread the Jane Austen books I read in my teens. I liked the second half of the book better probably because by then I was more familiar with the characters and so more interested in their life stories. I'll be sending it to Quico tomorrow. Just arrived. Thanks, BlossomU and Aneca. I'll read it asap. I would recommend this to the Jane Austen reader's: the others will miss most of the fun. This story about six very normal Jane Austen readers is an easy and enjoyable one. Being a Miss Austen admirer myself, I've enjoyed the comments about her books and the ways the caracters echoed Austen's caracters (like Jocelyn, the matchmaker hosting the discussion about "Emma"). Jane Austen wrote wonderful books about ordinary people living dull lives. KJF is no Jane Austen... but she made me want to reread "the real thing". And that's good. sent by quico through a bookring, thx! I liked her descriptions of each character for their variety, but not so much the discussions concerning the books themselves. What I really liked was to read the comments people over the centuries have made regarding Jane Austen. And also the questions each character poses.